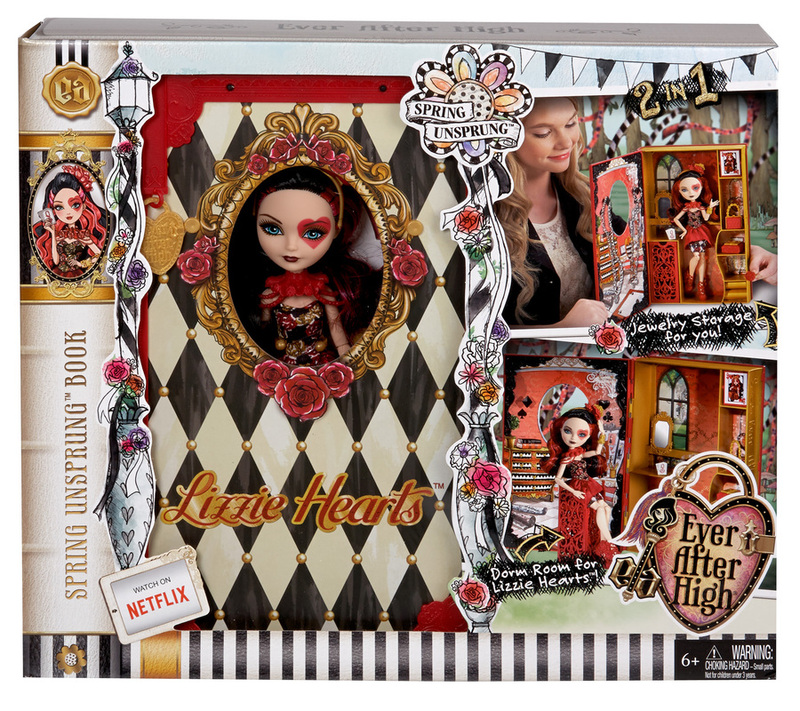 Springtime is an epic time to start a new chapter at Ever After High, where the teenage sons and daughters of famous fairytales decide whether or not to follow in their parents’ fabled footsteps. Spring is the season for the Spring Unsprung, a spellebration of renewal and creativity. Each year, a fableous fair is raised at Ever After High, and the girls get to put on their most spellbinding outfits. 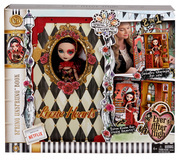 Included with this book inspired by the Spring Unsprung movie, Lizzie Hearts, daughter of Wonderland’s Queen of Hearts, looks positively wonderful displayed through a window in the “front cover” with its rich Harlequin print and golden picture frame detail. Open the book to reveal her dorm room, where she and her best friends forever after can get fairest for the springtime festival. A bookshelf with five compartments and pegs provide the perfect spots to store not only Lizzie’s accessories -- like an amazing quilted bag, a royally cool doll jewellery box and miniature deck of cards -- but also the girl’s. Set up the golden mirror and slide out the chair stored under the vanity to spring into party preparation. Lizzie Hearts will rule the fashion pages decked out in a luxe dress with flowered bodice, fitted skirt with wicked cool black and white pattern and red peplum. Amazing accessories -- like a hexquisite flowered hairpiece, spelltacular flowered red boots, a golden arm cuff and love-ly flower-adorned collar necklace -- send this outfit into happily ever after! When ready to go, flip to the back cover for a scene depicting the Well of Wonder, a secret entryway into Wonderland for more epic play and display opportunity. Girls will love recreating favorite scenes, playing out memorable moments and writing -- and rewriting -- their own happily ever after! 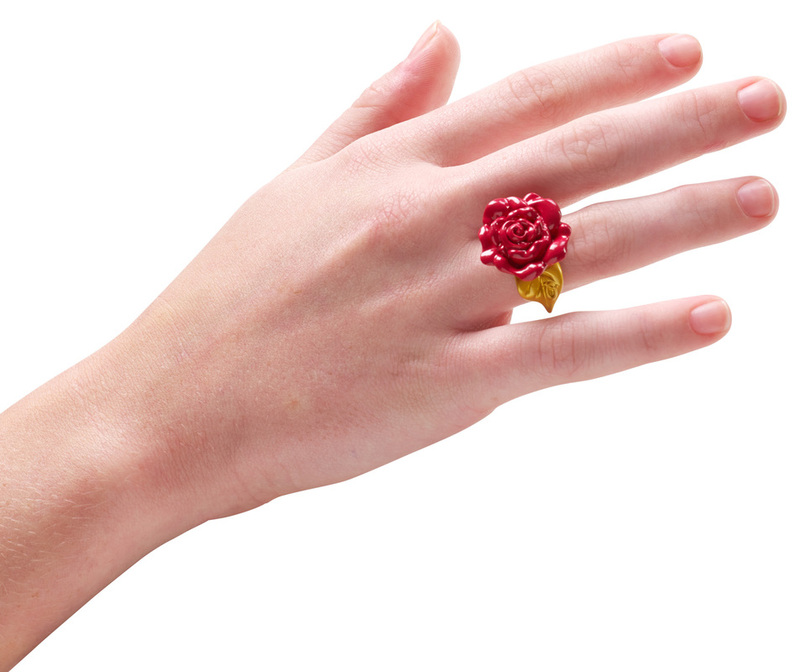 Plus, an included flower-decorated ring for the girl lets her also wear Spring Unsprung fashions. When the story is ended, store everything inside and close up to for beautiful display on girls’ shelves. Ages 6 and older.